Posted on April 29, 2018 Posted in Pudding	. As quinces in texture are similar to an apple and flavor like a sour nashi pear I opted for a cake style bake that would allow for a moist texture, but sturdy enough to holdup the heavy fruit pieces. 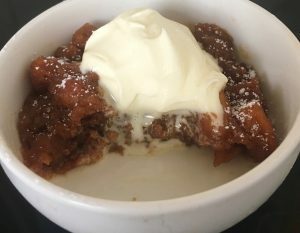 After a string of attempts I ended being very pleased with was a Quince pudding, in which I paired up with the complementing flavor of luscious golden syrup. Pre-heat the oven to 170g degrees. 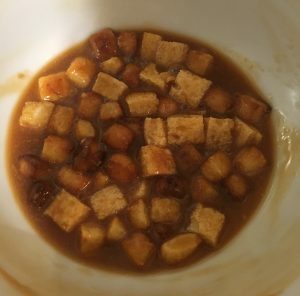 Place the diced quince in a bowl with the 2 tbsn sugar and the 1 tbsn water, stir. Place the bowl in the microwave for 5 minutes or until the quince has absorbed the water and sugar and is soft at touch. 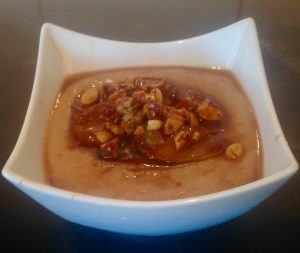 Once cooled, place the quince and all the remaining pudding ingredients into a food processor and blitz until smooth and creamy. 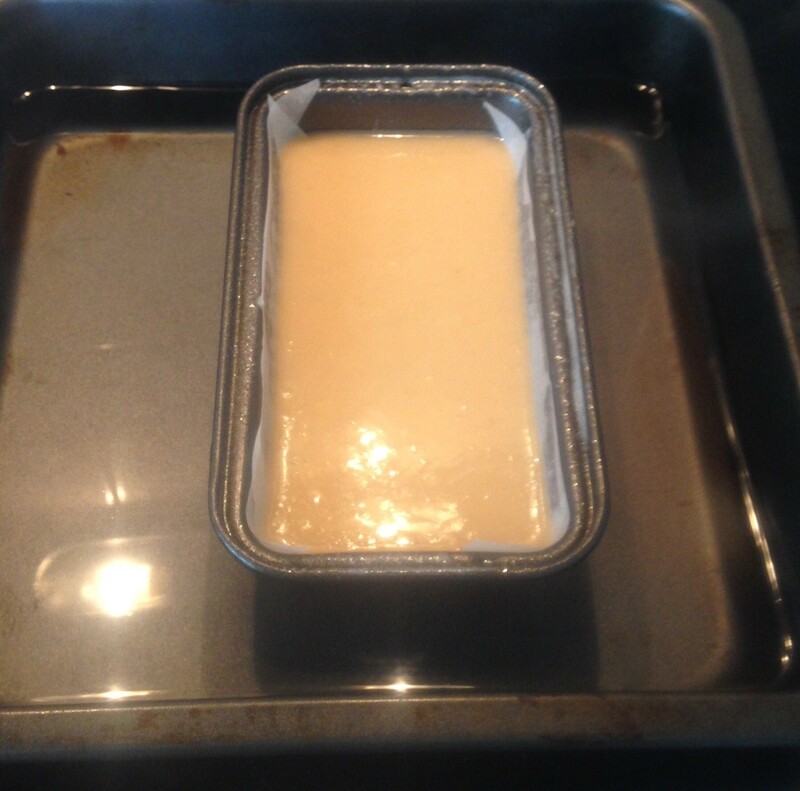 Grease 4 x 250ml (1 cup) soufflé ramekins with butter or oil spray. Place the ramekins into a roasting tray (or equivalent tray/tin/pan) and pour the mix evenly into the ramekins. Pour water into the bottom of the tray outside the ramekins until 1/3rd of the ramekins are under the water. 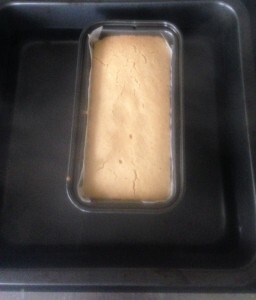 Place the tray in the oven and bake for 20 minutes or until the cake bounced back once touched. Remove the puddings from the tray and invert the ramekins onto serving plates. Serve with a good scoop of vanilla ice-cream or double cream. 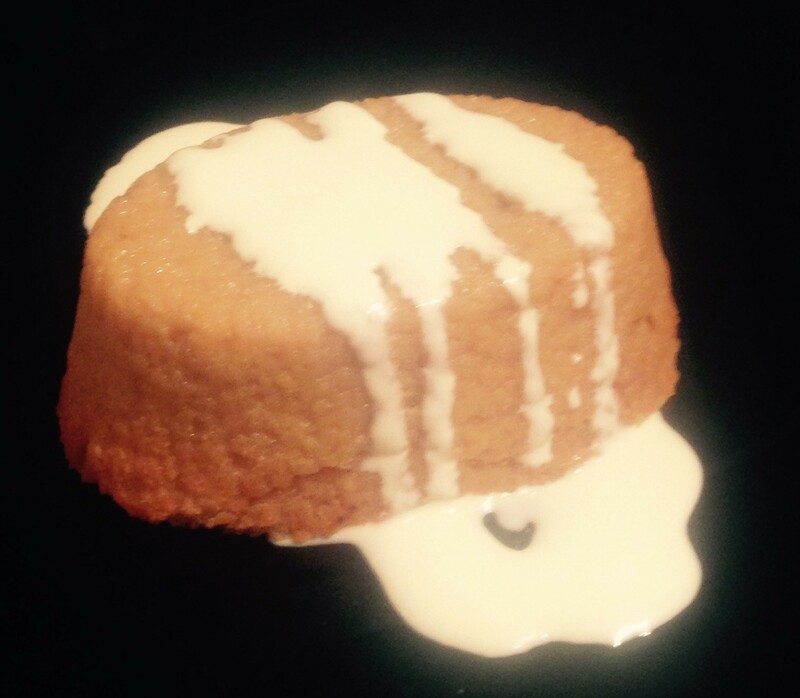 Top the pudding and ice-cream with a very generous drizzle of golden syrup and enjoy! Tags: golden syrup, quince, quince golden syrup pudding	. Posted on February 24, 2018 Posted in Pudding	. I recently made an ice-cream that featured the flavor combo of caramel sauce, butterscotch and peanuts in which was a tasty explosion success. To give this flavor combo a spin and an uncommon depth I opted to experiment with the combo via making a slice, tart, flan and pudding. 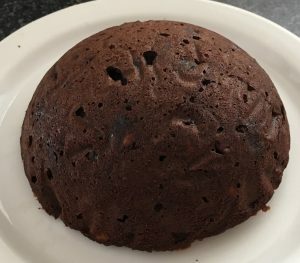 The winner, by far the pudding in which I used cubed bread as the base. Drying out the bread meant that the caramel sauce could be soaked up to really take on the flavor profile. 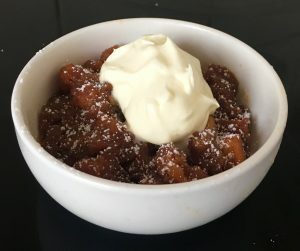 This recipe is simple, easy and delightfully unique as a scrumptious alternative to the traditional cinnamon and sultana bread and butter pudding. Preheat the oven to 170c degrees. Place the cubed bread into the oven and bake until golden brown, set aside to cool. 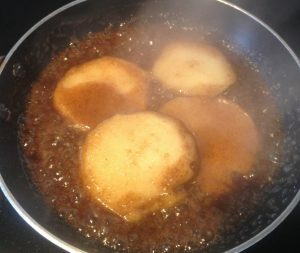 To make the caramel place 160g of the sugar in a saucepan on a high heat until the sugar has melted and is bubbly and golden in colour. Add the butter and cream and stir until combine (be careful of any splash). Take the caramel off the heat, add the salt and butterscotch schnapps then use a hand whisk to combine until silky. 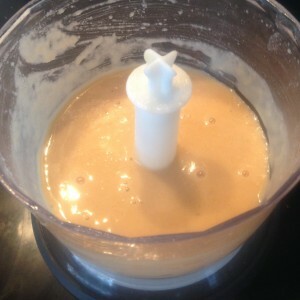 Add the peanut butter and whisk again until well combined, leave aside to cool to room temperature. Beat the eggs and the remaining 75g of sugar with the hand whisk. 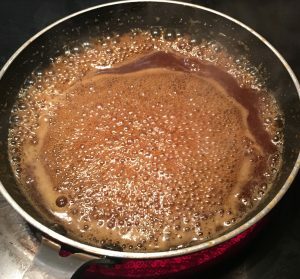 Add the egg mix to the caramel mix and beat until combine. 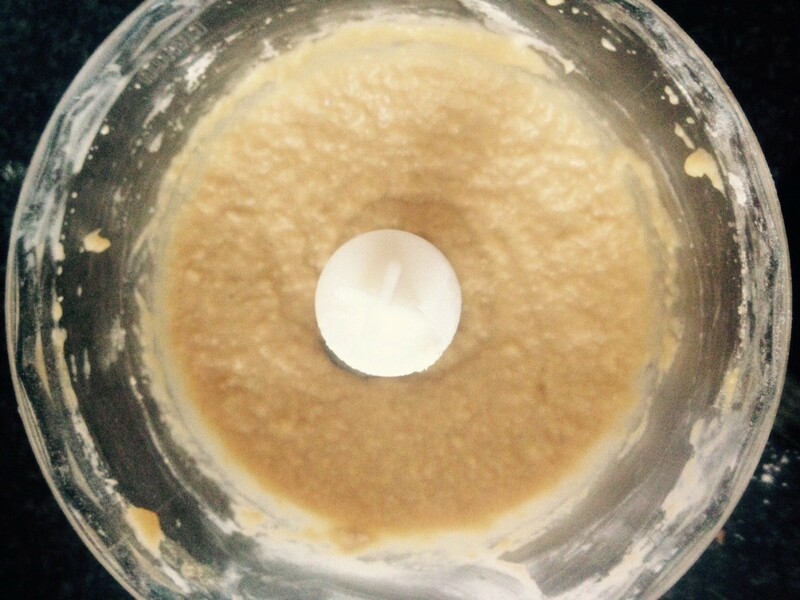 Add the bread cubes and stir to the caramel mix, leave the mix aside to soak up the liquid for 1 hour, lightly folding the mix every 15 mins. Lightly spray 4 x 1 large cup ramekins with oil spray then spoon the mix evenly into the moulds. Place the ramekins into a large slice tin and fill the slice tin with enough water to reach half way up the sides of the ramekins. 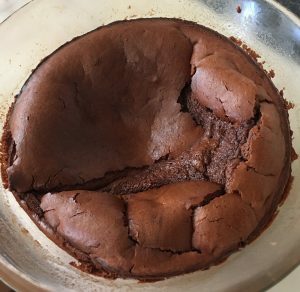 Bake for 10 minutes, remove the slice tin from the oven, giving the puddings a light stir to ensure the bread is throughout the mix evenly. 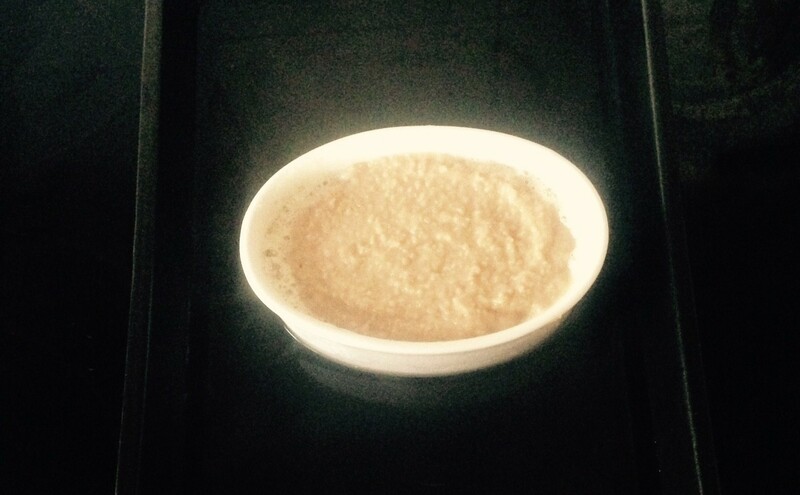 Following, continue baking for a further 25 minutes or until the pudding is puffed and set when you touch the top. 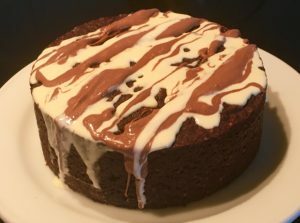 Top with vanilla ice-cream or double cream and enjoy! Tags: bread, bread pudding, Butterscotch Schnapps, caramel, Caramel Butterscotch Schnapps and Peanut Butter Bread Pudding, peanut butter, pudding	. Posted on December 9, 2017 Posted in Pudding	. 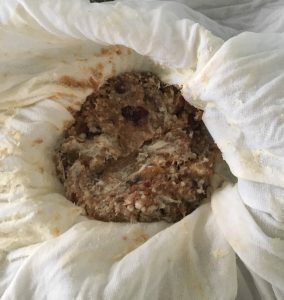 Christmas cake is not for everyone, in fact it tends to be an acquired taste for most, much like mince pies. 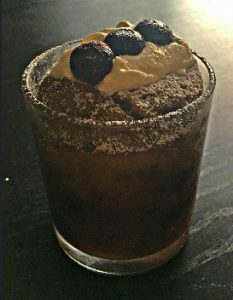 So to cater to all that are not in favor of the traditional taste I decided to come up with a pudding that would appease all. Think chocolate cake mixed with a traditional Christmas cake mixed with some extra crunch surprise. The dates takes the edge off the mixed fruit intense depth in flavor while the spices, nuts and honeycomb work well with the chocolate profile. Preheat the oven to 160c and line a pudding tin with baking paper. 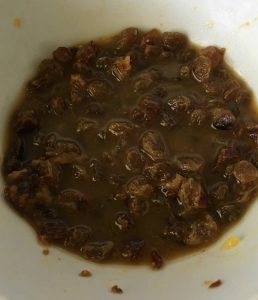 Place the mixed fruit and diced dates in a bowl with the brandy and orange and leave for 1 hour to absorb. 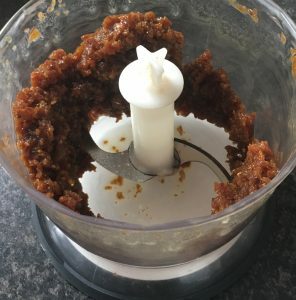 Place the butter and sugar in a bowl and using electric beaters whisk for 3 minutes until light and fluffy. Add the eggs one at a time to the sugar mix, beating in between each addition. Sieve the flour, cocoa powder and spices into the sugar mix. 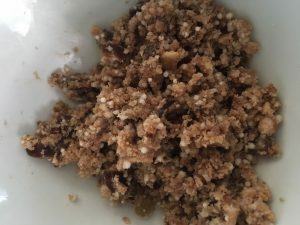 Add the fruit mix, breadcrumbs and nuts and beat until mix is combine. Lastly, add 150g of the honeycomb and stir until combine. 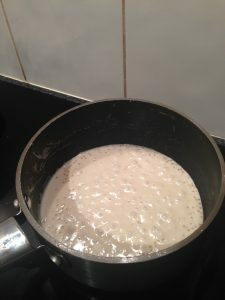 Pour the mix into the prepared tin, flatten with a spoon and place the lid on the tin. Bake the pudding in the oven for 90 minutes or until a skewer inserted in the center just comes out clean. 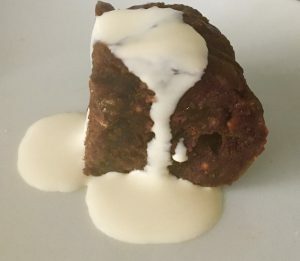 Place the pudding on a cooling tray until cooled completely. 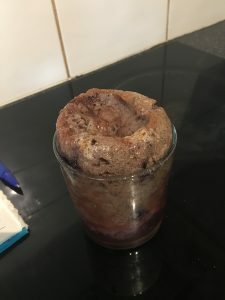 Meanwhile, add the chocolate and cream into a bowl and heat in the microwave on a low power of 1 minute or until just starting to melt. 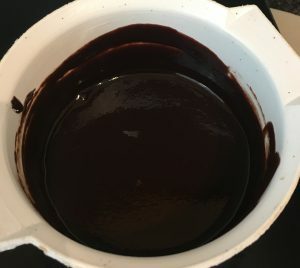 Stir the ganache until silky smooth. 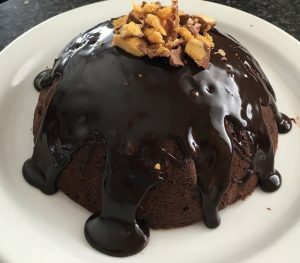 Turn the cooled pudding upside down onto a plate and pour the ganache over the top, scatter with remaining diced honeycomb. 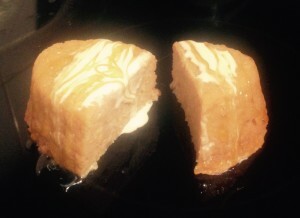 To serve cut the pudding into slices and accompany with ice-cream or double cream. 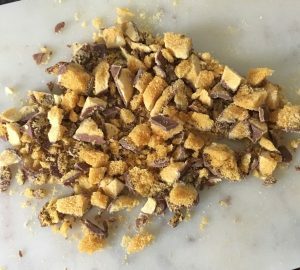 Tags: breadcrumbs, chocolate, Chocolate Honeycomb Spiced Christmas Pudding, cinnamon, dates, fruit, ginger, honeycomb, nutmeg, pecans, spices	. Posted on October 14, 2017 Posted in Pudding	. I very rarely bake with blackberry, in fact it tends to be one of the last berries I’d consider. However, Port on the other hand tends to appear in my recipes time and again, particularly to enhance chocolate depth. Considering my go to Port is red, in which holds a strong raspberry, blackberry and chocolate flavor I thought that leveraging the berry pairing with this sweet dessert wine was a good way of boosting the blackberry palate. Adding the blueberries to the mix taps into the earthiness of the port and blackberry and compliments. Lastly, the lemon zest acts as an enhancer to the unique flavors already-present and adds some additional oomph. All up when I came up with this recipe I thought it could have a potential to be a boring and so-so outcome, however it turned out to be the opposite. A dessert I was going to ‘sample’ with a small spoonful, however in reality I couldn’t put it down and ate the whole pudding in a matter of seconds. A sure sign that the desert is a super success. Pre-heat the oven to 160c degrees and spray 4 x 1 cup ramekins with oil spray. 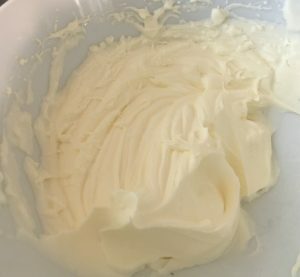 Place the butter in the microwave in a bowl and heat until the butter is melted. Add the jam and beat with a hand whisk until combine. Add the milk and lemon zest and beat until combine. 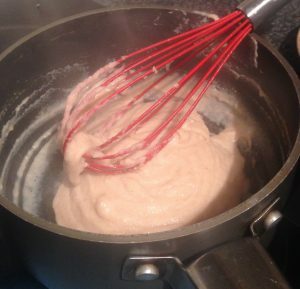 Sieve the flour and sugar into the mix and beat with the hand whisk until combine. Add the blueberries and stir until well combined. Pour the mix evenly into the 4 ramekins. 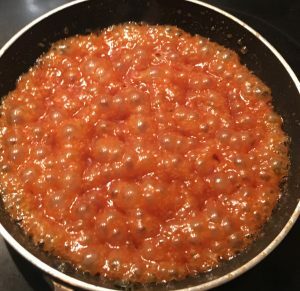 Place the sauce ingredients into a bowl and heat in the microwave until the mix just starts to boil, beat with a hand whisk until well combined. Pour the syrup over the back of a spoon over the batter in the ramekins. Bake in the oven for 25 minutes or until the top if the pudding is set and crisp. 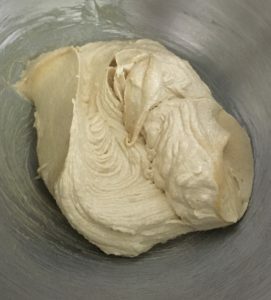 Meanwhile beat the cream with electric beaters until peaks form. 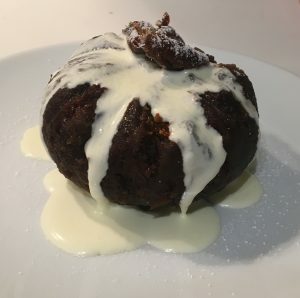 Leave the puddings for 5 minutes before serving with a dollop of the cream and extra berries if you desire. 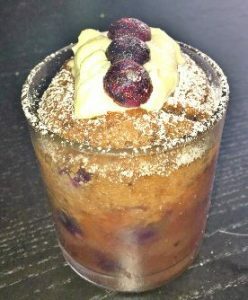 Tags: berries, Blackberry, Blueberry, lemon, Port, Port Black & Blue Berry Pudding, pudding	. Posted on September 16, 2017 Posted in Pudding	. 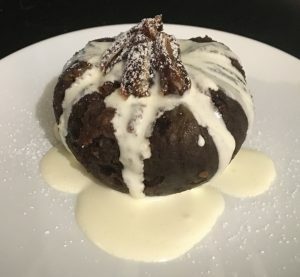 Recently I needed to make a gluten free pudding for a dinner party, however I didn’t want to use a gluten-free flour as I wanted a really really fluffy texture, almost like a soufflé lightness and from my experience gluten-free flour tends to produce a bit of a denser texture. Therefore, I ventured into the kitchen and did some experimenting with a range of alternative base ingredients. 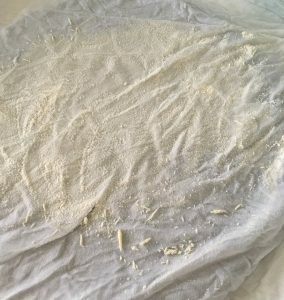 Surprisingly (almost bizarrely) the ricotta experiment produced the most amazingly light texture that just melts in the mouth. 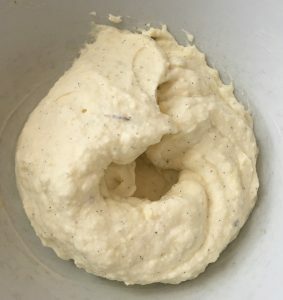 Keeping with the ricotta theme I completed the dish with my always successful crowd pleasing ricotta ice-cream. 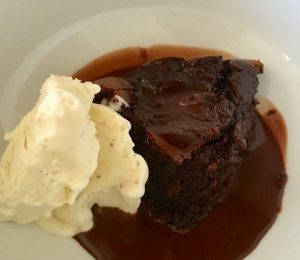 This recipe is super moreish but not too sweet thanks to the dark chocolate and limited sugar in the pudding. In a food processor blitz the cheese, condensed milk and vanilla until smooth. 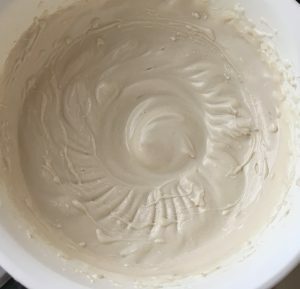 Whisk the cheese mix and cream with electric beaters in a bowl until peaks form. Stir the liquor until well combined and place in a bowl in the freezer to completely set. To make the pudding place the cream and milk into a bowl and heat in the microwave until steaming. Add the chocolate in pieces to the milk mix and stir until silky smooth and well combined. 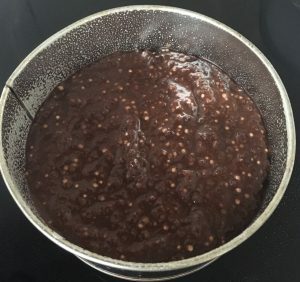 Place the chocolate mix, ricotta, cocoa powder and coffee granules into a food processor and blitz until well combined. 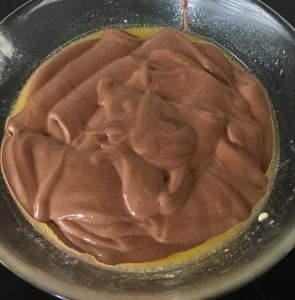 Separate the egg yolks from the whites and add the yolks to the chocolate mix, blitz until smooth and well combine. 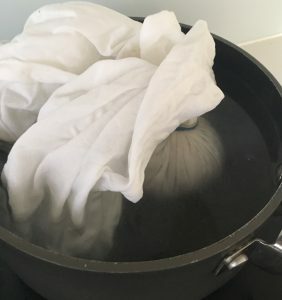 Place the egg whites into a bowl along with the salt and beat until soft peaks form. Add the sugar to the eggwhites and beat for 5 minutes or until the mix is glossy and smooth. 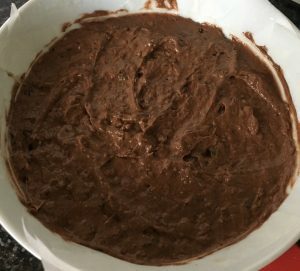 Fold the chocolate mix into the eggwhites until only just combined. 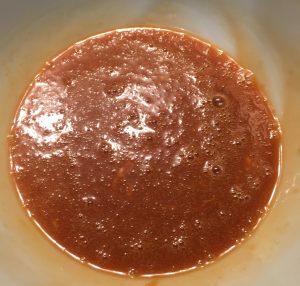 For the sauce, place the cream into a bowl and heat in the microwave until steaming. 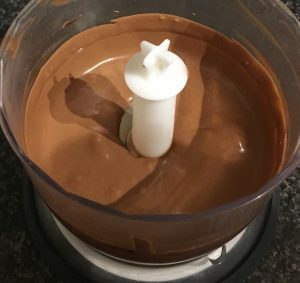 Add the chocolate pieces to the cream and stir until silky smooth and well combined. Add the 20g of extra butter, melted, to a pudding bowl and roll the bowl around to ensure all slides are covered in butter. 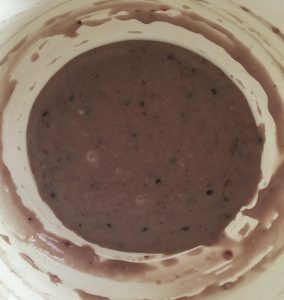 Pour the pudding mix into the bowl and cook in the oven for 45 minutes or until a skewer inserted into the center comes out almost clean. 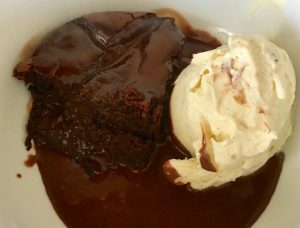 Spoon the pudding into serving bowls, top with the chocolate sauce and a scoop of the ricotta ice-cream. Tags: chocolate, Chocolate Ricotta Cheese Pudding with Ricotta Ice-Cream, dark chocolate, ice-cream, pudding, ricotta, ricotta cheese	. Posted on May 27, 2017 Posted in Pudding	. 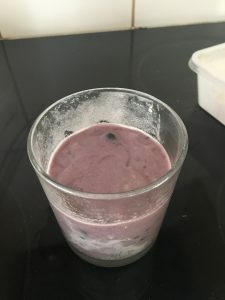 Ok so this recipe sounds boring and bland but i’ll tell you what, the taste and texture blew my mind. 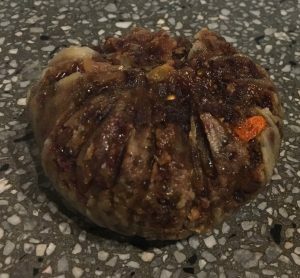 The texture was so interesting and addictive, unlike any cake that I have had before. 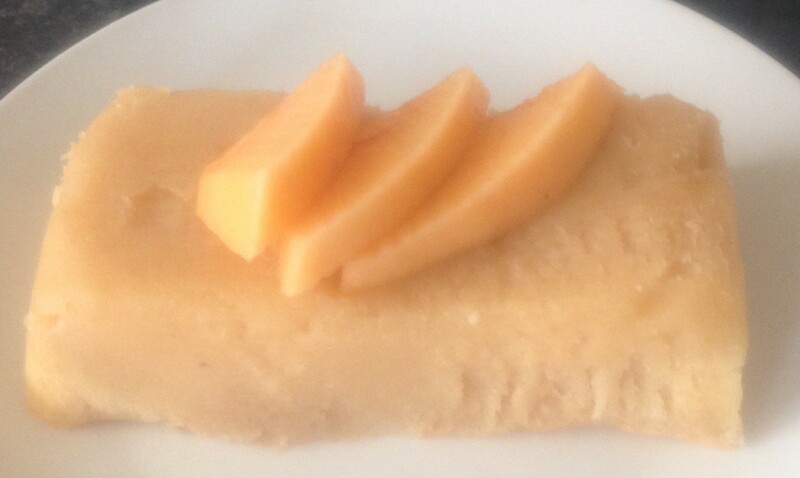 So delicate and melt in your mouth with the beautiful cantaloupe flavour. 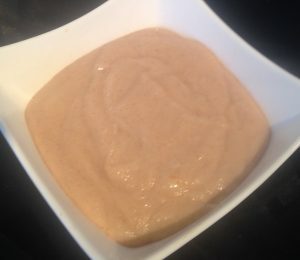 For a while I have been trying to product a cake that heroes cantaloupe and not until now have I make up a recipe where the cantaloupe flavour was not over powered and really sung. Honey, citrus, ginger and cantaloupe = a delicious flavour combo. Spray 4 x 200ml cake moulds with oil spray. Pre-heat the oven to 170c degrees and place water into a roasting pan until it reaches 1/3 up the side of the pan (waterbath technique). 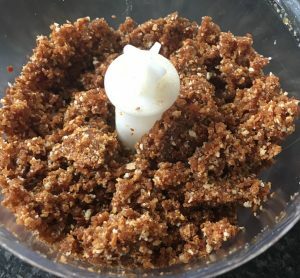 Place the sugar, rice flour, vanilla, cantaloupe, honey, ginger, salt and citrus zest in a food processor and blitz until smooth and well combine. Pour the cake batter into the 4 ramekin moulds, 150ml in each. 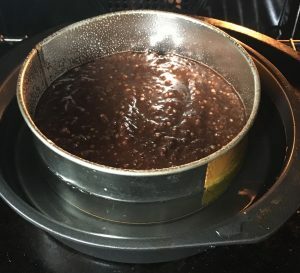 Place all the ramekin moulds into the baking dish, ensuring no water gets into the moulds and the water is just over half way up the side of the tray. Bake in the oven for 30 minutes or until a skewer inserted in the middle just comes out clean. Do not over cook, the top should only just be set. 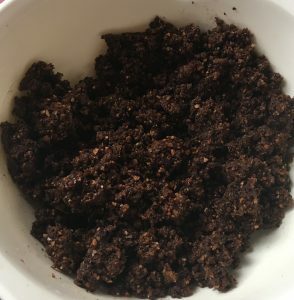 Meanwhile to make the syrup, place all the syrup ingredients into a food processor and blitz until smooth and well combine. 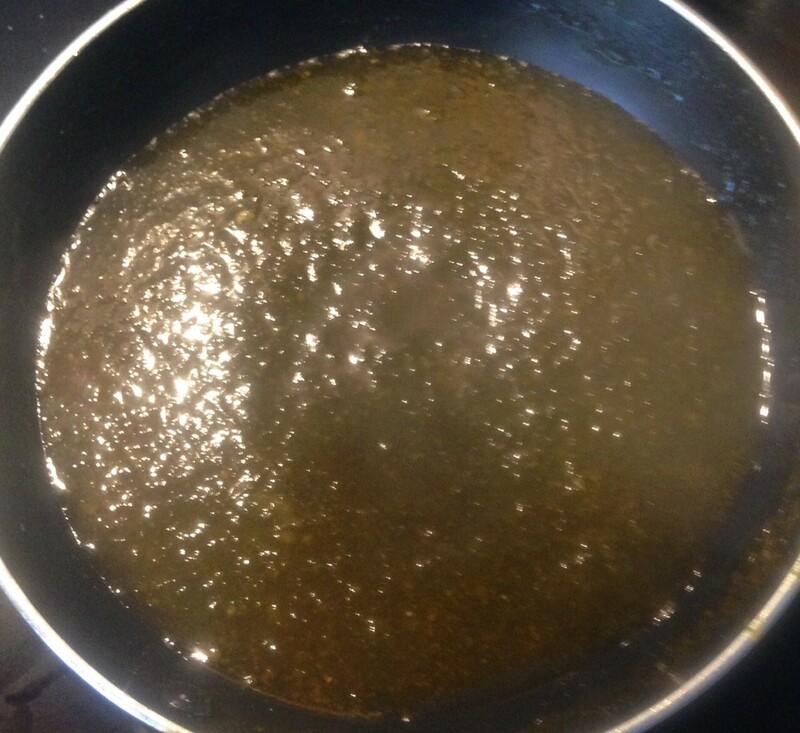 Pour the syrup into a saucepan and stir on a high heat, allowing the mix to boil for 1 minute. Pass the syrup through a sieve and leave aside to cool. 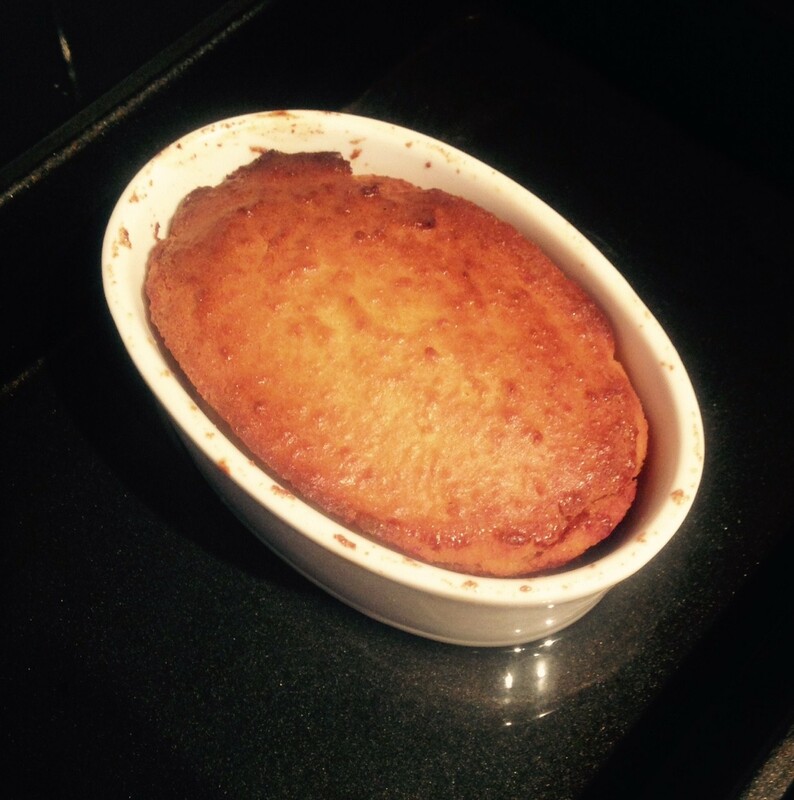 Leave the ramekins moulds on a cooling tray for 10 minutes before inverting onto a plate. 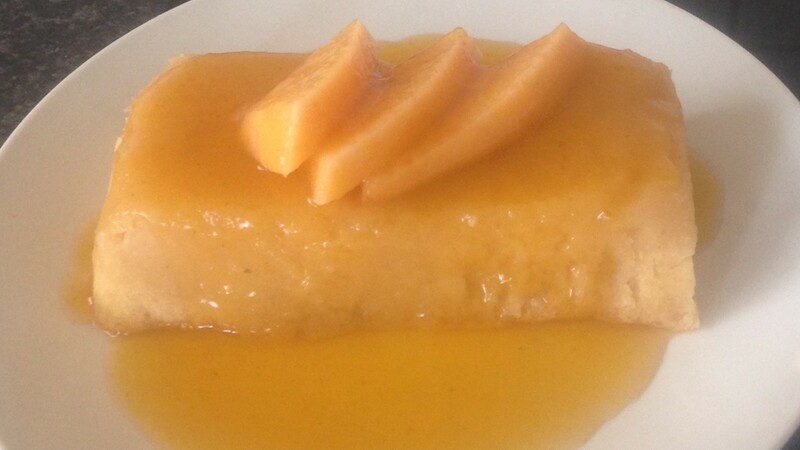 Place some additional pieces of cantaloupe over each pudding and pour the cooled syrup over the top, enjoy! Tags: cantaloupe, ginger, honey, lemon, lime, pudding, Rice, Steamed Rice Ginger Citrus Cantaloupe Pudding	. Posted on May 15, 2016 Posted in Pudding	. 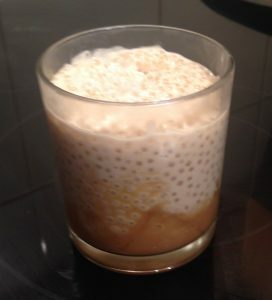 I have done quite a few experiments with tapioca/sago with a varying range of results. To be completely honest 90% of the time the end result is disappointing, bland and needs more sweetness. 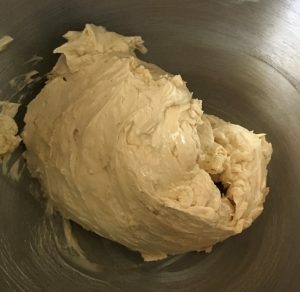 This recipe’s success was a major surprise. 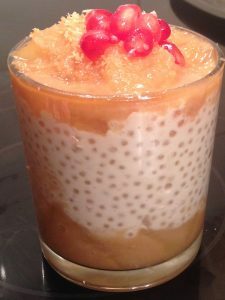 The flavors of coconut, lime, ginger and pineapple all make perfect sense to be combine into a lovely treat, though it’s the caramel sauce made with coconut milk and a slight tang of lime juice that really steals the show. 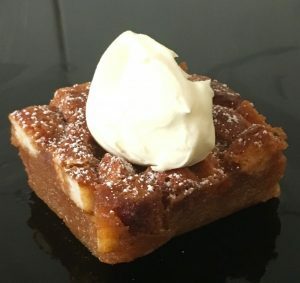 This little addition brings the recipe to a new level and makes the dessert so moreish. 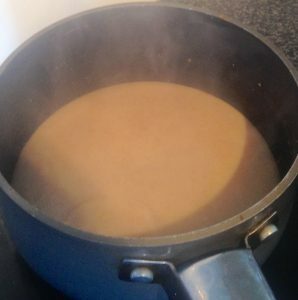 Place the coconut milk, 200ml coconut cream and white sugar into a saucepan and stir on a high heat until the sugar is dissolved and the mix is boiling. 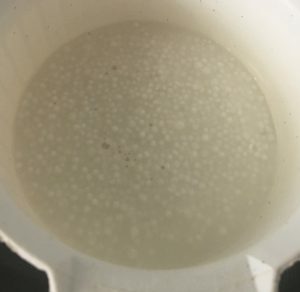 Add the tapioca and bring the recipe down to a simmer and cook for 25 minutes stirring frequently until mix thickens and the pearls are transparent with a white dot in the center. Pour the mix into a bowl and leave aside to cool. 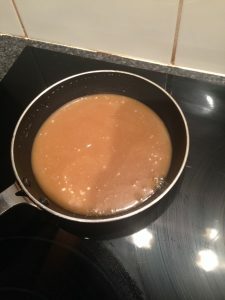 Meanwhile to make the sauce place the remaining 200ml of the coconut cream and the brown sugar into a saucepan and stir on a high heat until well combine and the sugar is dissolved. 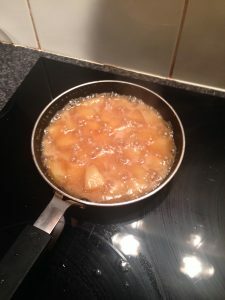 Add the pieced pineapple, the ground ginger and the lime juice and stir for 3 minutes or until the mix thickens to a caramel consistency. Take the saucepan off the heat and leave aside to cool. Spoon half of the sauce and pineapple into the base of 6 cup ramekins. Spoon the tapioca mix into the 6 ramekins evenly. Top with the remaining sauce and pineapple. 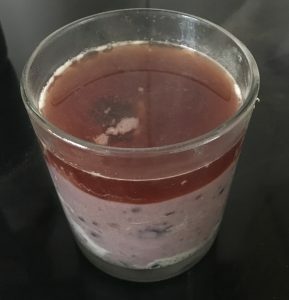 Place in the fridge for 1 hour to set completely. I have topped with some pomegranate for some extra colour. 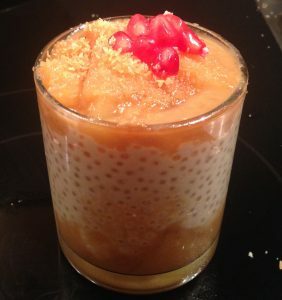 Tags: coconut, ginger, lime, pineapple, Pineapple Lime and Coconut Tapioca Pudding, tapioca	.